A tree collapsed Friday afternoon, taking down two balconies of a porch and preventing first responders from getting to a puppy on the lowest level. The tree came down in the rear of a home on the 5800 block of South Carpenter Street. About 12 people, mostly children under 12 years of age, occupied the two-story home. No injuries were reported in the collapse but officials from Chicago's Department of Buildings feared the structure was not stable and prevented authorities from getting to the 4-month-old pup. Crews from Commonwealth Edison were called in to take care of power lines that had been brought to the ground. Once the area was deemed safe, someone was able to go back into the home, open the door, and let the dog inside. All of the people and Misty the dog were safe Friday night and finding alternate lodging. 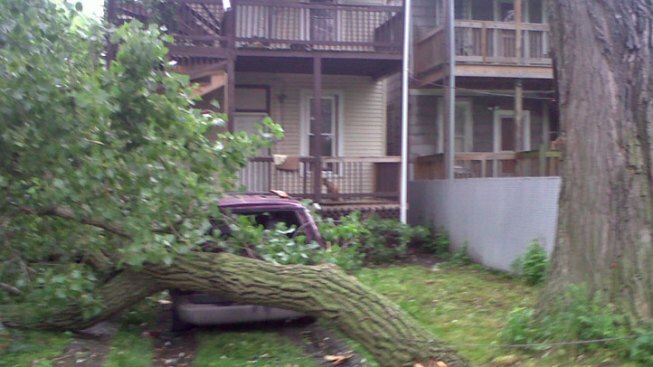 The collapsing tree also crushed and totaled a minivan parked in the driveway. Misty, a 4-month-old pup, was trapped by the falling tree.